THANK YOU FOR VISITING - THE COMMUNICATION AND CONFLICT NEWSLETTER HAS NOW BECOME CAOTICA BLOG - please click on the banner below to find out more or simply register in the email sign up form below. 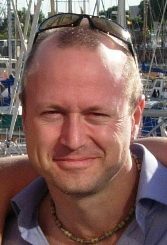 This has happened in December 2012 to bring together Alan's own website newsletter from Communication and Conflict and updates from his work at CAOS Conflict Management into one blog, CAOTICA, with its own Newsletter. Please visit CAOTICA by clicking on the banner below to find out more. If you like it you can sign up for the Newsletter below or on the blog itself. When we are involved in unresolved conflict, it can seriously, negatively affect our health and happiness! Often this leads to a 'fear of conflict', meaning we then either try to avoid it (impossible) or we think we have to 'win' it (also impossible). Seeing it this way leads to a feeling of being stuck, like there's no way out, like banging our heads against a brick wall. But 'Fight or flight' are not the only response options when it comes to conflict. When we believe they are, we create a vicious circle of responses that always deny us the opportunity to learn from our experience of conflict. The CAOTICA blog discusses and promotes a more constructive and self-supporting approach to dealing with such situations. The Newsletter content is often challenging, sometimes a little controversial as it doesn't follow some of the 'standard' tips and ideas for responding to conflict that you will find in books and on the internet. 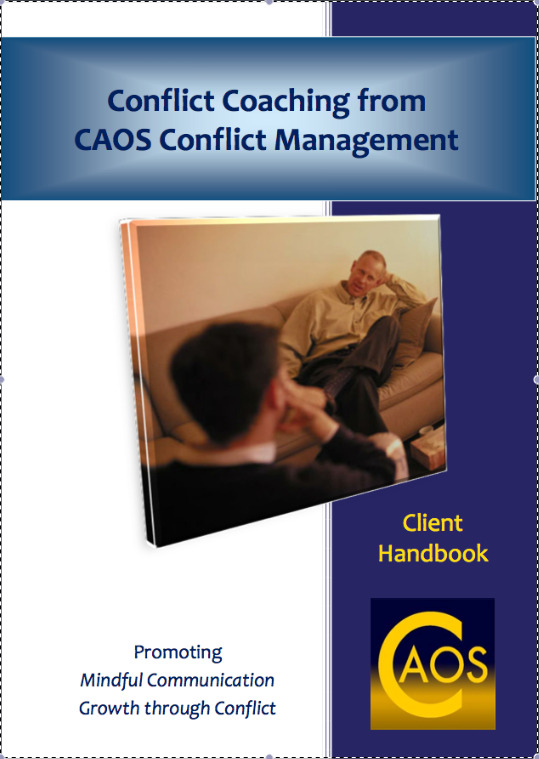 It is based on day to day experience and insights drawn from the practice of mediation, which supports people who have become embroiled in conflict that has not been resolved. These insights are gained from real, everyday difficulties. I have worked in mediation for 14 years as a Mediator, Trainer of Mediators and as a Conflict Management and Communication Skills Consultant. .....................................and how the two seem to be related. I will very rarely quote theory at you or become 'academic'. The information, tips and insights in the Newsletter, and on the website as a whole, just deal with what 'works'......and what doesn't. And why we sometimes find it difficult to do what works. And how we can learn to overcome that difficulty. Check it out by subscribing in the box below. You can always unsubscribe if you don't want to continue receiving it and I absolutely guarantee I won't pass your details on to anyone else. Click Here to look through all the Newsletter back-issues. The CAOTICA blog Newsletter offers insights from the practice of mediation. When communication breaks down and conflicts are responded to destructively, mediation promotes the return to a more constructive and creative response. Thank you for your interest. I hope you decide to subscribe to this free newsletter. 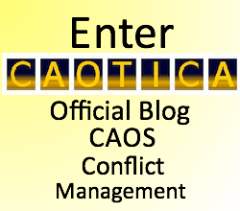 I hope you will find the CAOTICA blog Newsletter useful and supportive in developing your own communication skills and your ability to respond to conflict constructively and as an opportunity for learning, connection and insight. .... and others, can all be reduced, or even eliminated, through greater awareness of how you approach communication and conflict in your life. PS - You can also subscribe below to the Communication and Conflict RSS feed which will keep you updated on additions or modifications to the Communication and Conflict website.